I emailed Andrew Devlin this morning and he kindly provided me with the walkability map and comments that he used in his presentation last night. 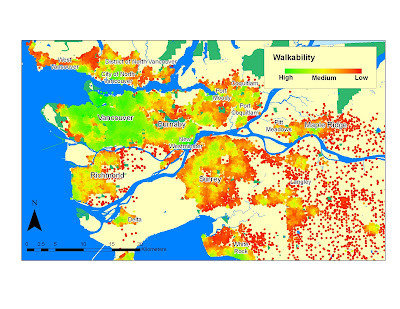 "Note that each dot on the map corresponds to a postal code in the region. We base our measure of walkability around four built environment characteristics known to relate with walking: net residential density, commercial density, land use mix, street pattern. We measure these characteristics within a 1-km street buffer radiating from each postal code. As you would expect, the more walkable places in the region are characterized as being more compact, having a diverse and functional mix of land uses close by, and more of a gridded street pattern. Least walkable areas are less compact, single use neighbourhoods with an irregular street pattern that makes walking unattractive..."